In a large bowl, combine mustard, honey, oregano, oil, garlic powder and cayenne pepper. Mix well. Add chicken and mix well. Let marinate for 30 minutes. Heat up the grill or a frying pan on medium heat. Cook the breasts for 4-7 minutes on each side, until a thermometer reads 170 °F. As the chicken cooks, add more of the honey mustard marinade so it can be really flavorful. Remove chicken from heat and let cool for 10 minutes. Use two forks to pull apart the chicken breasts. Line a baking sheet with nonstick paper. Set aside. Take a puff pastry disc and fill it with 2 tablespoons of the chicken. Fold in half and use a fork to press down the borders. Place it on the baking tray. Repeat the process until you’ve used all the discs. In a small bowl, combine egg and water. Brush the egg wash over the empanadas. Sprinkle with poppy seeds. Bake for 20 minutes or until they are golden. To save time, use leftover chicken or make it ahead of time. Empanadas are one of my family’s favorite food. It doesn’t matter what they’re filled with, they are always a success. This time I filled them with honey-mustard chicken. The combination of flavors is perfect and will bring a different taste to your table. 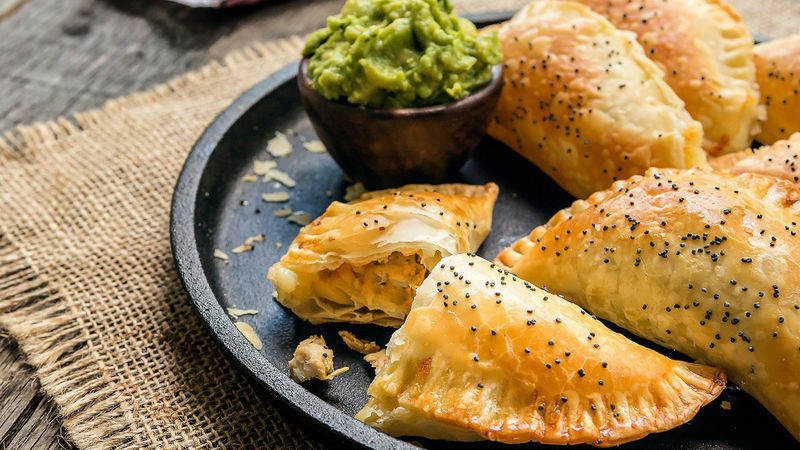 To save time, you can make the chicken the day before and refrigerate it until you’re ready to make your empanadas. Serve them during snack time, lunch or dinner. For a complete meal, serve them with a side of delicious Go-GURT®.